Discussion in 'France' started by SportBoy333, Aug 2, 2017. Nice narrowly edges past Ajax in the Champions League. On to the next round! Bordeaux eliminated from the Europa league by a club from Hungary lol. Err ..... after eliminated last season Europa League finalist Ajax, Nice has been draw against Napoli in the UCL playoff round lol. I like Nices chances. They lack European pedigree but have more talent. Really? I like Nice but they're not on Napoli's level player wise. They might have it in them to make up the disadvantage as a team unit. They have 0 pts from their first 2 league matches and no one would have predicted that. Still a team in construction dealing with injuries and new signings. Napoli lost no one important off last years team ? They have the clear advantage. I don't think Cyprien, Balo, nor Sneijder have played a Ligue Un minute yet. Would be shocked if they managed to flip the aggregate scoreline. Nice's defense is very average. I agree but Im still excited for the match. As for Seri. as long as he helps them qualify and the club gets that 20 m check then its all good. Very few players or clubs are gonna turn down Barca if they are after you anyway. Liverpool can do it for Countinho but Nice are not Liverpool. Well its over and France falls short yet again. So many times the 3rd place French team has to beat the 3rd place team from Spain and Italy and always falls short. Next year with those countries getting guaranteed 4 spots, the 3rd place French team can avoid a team from one of the top 4 leagues and have a much better chance of getting 3 group stage spots. Good with one zero for my favorites in french and EL also this season. Marseille not any favorite even they're winning EL 2018. Are my expert odds. Monaco another draw. Bottom of group. Qualification virtually gone. They had talent on the pitch, Balde,Tielemens, Fabinho, Moutinho, Lemar went off but they brought on Jovetic. Too dependent on Falcao I guess. 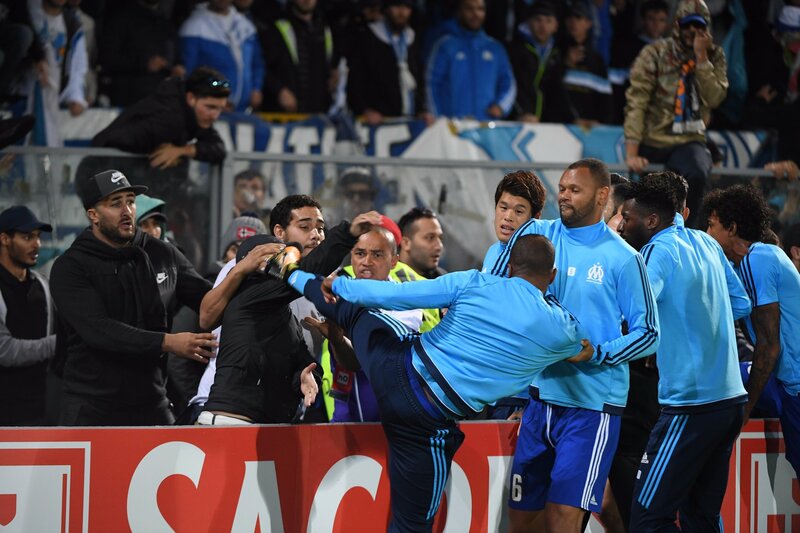 Patrice Evra fighting with Marseille supporters. Not sure the whole story here. He lost his starting spot to Jordan Amavi and being a guy who's always been on top, it didnt seem like his ego could handle being a sub/part timer. PSG vs Celtic hmmm. I think maybe the Champions League should get smaller and have less teams involved. Create a 2nd tier comp for clubs like Celtic who can compete to win it. I also got tired of reading Celtic fans saying PSG has no history I mean yes they haven't been around for a long long time but they were a big club in the 80's and 90's and won titles and trophies domestically and in Europe before QSI took over so to say no history is sour grapes IMO. Its not a long history like other clubs but its there. Stop hating, people. This isnt Stade Rennes would have been around a lot longer than PSG and have won basically nothing. There the ones with no history imo. Paris SG advanced to CL round of 16. Lyon, Marseille and Nice all advanced to EL round of 32. ^ Which is why you dont build a team solely to win the Champions League but thats what Paris does. Anyway, Marseille vs Braga. Marseille should be favored but of course its no surprise if they lose. Lyon vs Villareal. Lyon favored but again no surprise if they lose. Nice vs Lokamotive Moscow. Nice are red hot right now but they are facing a good team so they are the underdogs but they can still spring an upset. Surprisingly Marseille have been progress to the semi-finals of the Europa League after a remarkable came back victory 5-3 on aggregate over RB Leipzig in the quarter final. And with the favorable draw against RB Salzburg in the semi-finals. I do think Marseille now will have a decent chance going into the final, in which the final will be held at the Lyon stadium this year too.